MANAGEMENT BY DAVID M. SHEDD When a management known for brilliance tackles a business with a reputation for bad economics, it is the reputation of the business that remains intact — Warren Buffet doubled to price at say $500 for a healthy 50–60 percent margin. As Professor Fader worked through the problem from the perspective of the cus- tomer, we all quickly realized that this unique part had a value to the customer in the range of $10,000, with the actual price being somewhere near $4,000. In this case, the value to the customer was far higher than our internally focused radar would suggest. Strategic Planning—It's All About Being in the Right Market This one is easy to say, devilishly tricky to do. The fundamental of strategic planning is to be in the right market. That is, to be in a good industry or market niche with growth and healthy profit opportunities. A good market makes your life a whole lot easier and more profitable. As Warren Buffett said so well, "When a management with a reputa- tion for brilliance tackles a business with a reputation for bad economics, it is the repu- tation of the business that remains intact." Twenty years ago, we had a few fellow grads go into the airline industry. Guess what? Within a few years, all had left. As a business to make money and grow and per- sonally advance, the airline industry stunk back then. And it still stinks today. Leadership—It's All About the Best Team As you advance in your career, your capabil- ities and individual brilliance will only take you so far. Vastly more important will be your ability to lead and unite a diverse team and drive them to success. As Satchel Paige said, "None of us is as smart as all of us." The teamwork, team activities and team building encountered in business school should resonate. The best answers and the deepest insights come when working with a good and diverse team that includes com- mitted people with a wide background (fi- nance, HR, management, marketing, sales, even the customer), unafraid to share their views and be heard. Alas, many corpora- tions have forgotten this simple premise. Their top management teams are either a team of clones or too cowered by an over- bearing CEO to ever share their true views. The net result is often groupthink and abysmal corporate failures. 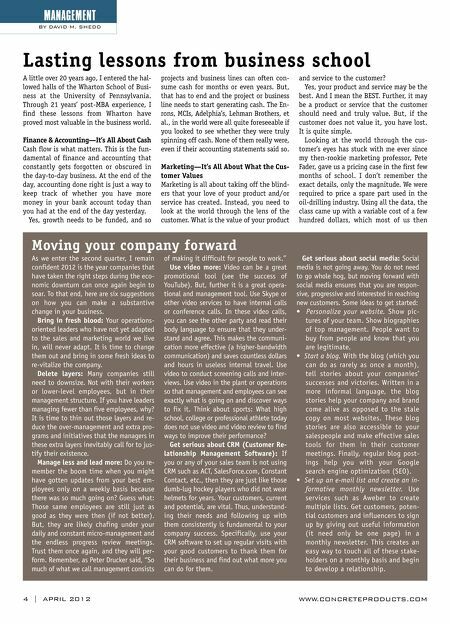 WWW.CONCRETEPRODUCTS.COM APRIL 2012 | 5 International Business—It's All About Understanding the Other Person's Culture "The world is flat." "The end of history." "English is the global language." Maybe. But, doing business internationally re- mains all about understanding your Chi- nese supplier or your Brazilian consumer or your German joint venture partner. I think comedian Dave Barry summarizes well the blinders and distorted view of many Americans in our increasingly inter- national world. Americans who travel abroad for the first time are often shocked to discover that, de- spite all the progress that has been made in the last 30 years, many foreign people still speak in foreign languages. So, look around your market and get to know the increasing number of international col- leagues and customers. Besides the advan- tage of networking, your new friends will challenge you to think more broadly and see the world through their eyes. David M. Shedd heads Winning B2B Leadership, an advisory firm serving small to middle- market com- panies in the concrete prod- ucts and other manufacturing industries. His experience includes 10-plus years in executive posi- tions with a major precast concrete pro- ducer. He is the author of Build a Better B2B Business and maintains a blog at www.helpingleaderswin.com. He can be reached by e-mail at davidshedd @cox.net, or by phone at 480/734-0569. 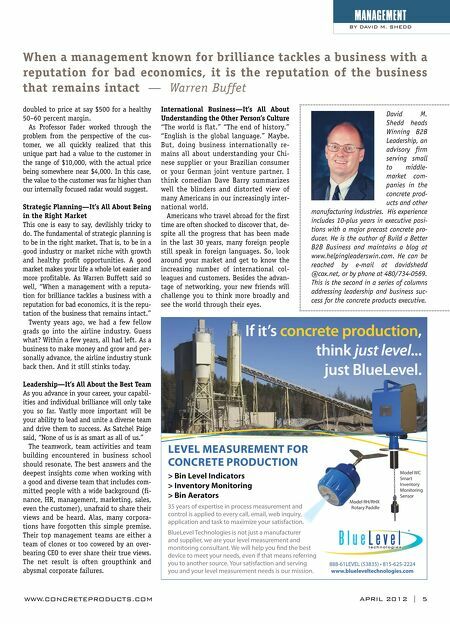 This is the second in a series of columns addressing leadership and business suc- cess for the concrete products executive.